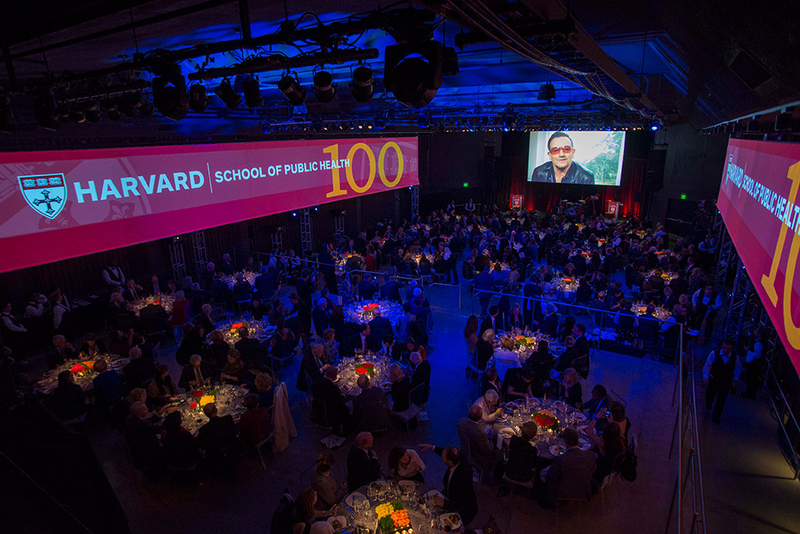 A recorded message from U2 lead vocalist Bono began the HSPH Centennial Gala. Lilian Cheung, S.M. ’75, S.D. ’78, and Donald Hopkins, M.P.H. ’70, celebrate HSPH's centennial. 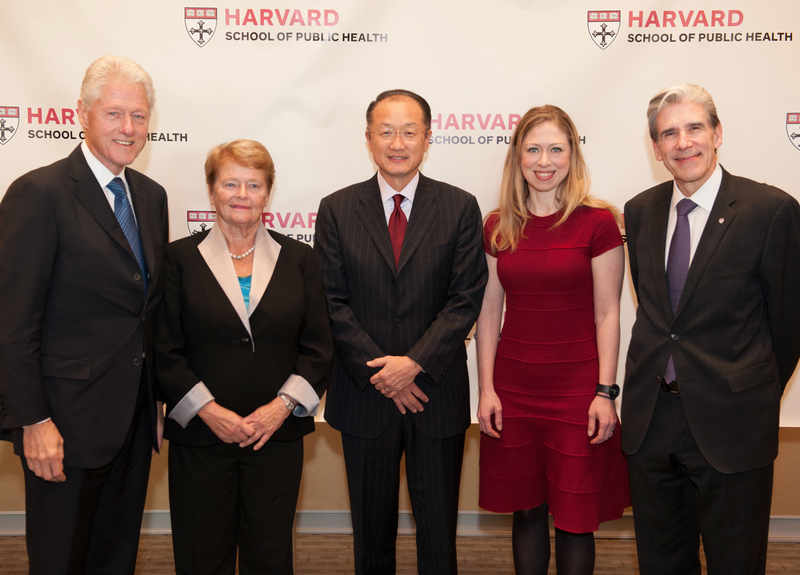 Harvard School of Public Health (HSPH) launched its $450-million capital campaign this week, the first school to do so following the unveiling of the $6.5-billion University-wide Harvard Campaign on September 21. The campaign began on the auspicious occasion of the school’s centennial (see “100 Years of HSPH” for more on the past and future of public health) campaign events opened on Thursday, October 24, with the awarding of three Centennial Medals and the inaugural Next Generation Award (recipients included Bill and Chelsea Clinton) and an evening gala that marked the official launch of the campaign. Friday’s schedule includes a presentation by Dean Julio Frenk (see “A Global Health View”) on the “Second Century of HSPH”; faculty members leading small group discussions; a panel of ministerial-level public-health officials from around the globe weighing in on their experiences at the frontlines; and a school-wide celebration. The campaign comes amid difficult financial times for the school. In fiscal year 2012, HSPH received only 14 percent of its operating revenue from the Harvard endowment, less than any other school. (Endowment distributions contributed 35 percent of revenue for the University as a whole—and 85 percent of the operating revenue of the Radcliffe Institute for Advanced Study, which unveils its capital campaign on Monday.) That same year, HSPH derived about 73 percent of its income from sponsored research, most of that from the National Institutes of Health—but government funding has fallen dramatically in the wake of sequestration budget cuts. “We are aware that we’re living through very turbulent times, financially,” Frenk said in an earlier interview, “and we need to be prepared for that.” The school has moved to diversify its income: it has created an office of research strategy and development to compete more aggressively for limited federal funding, and has increased its tuition revenue by investing in executive- and continuing-education programs. Nevertheless, a major focus of the campaign is to secure long-term funds to put HSPH on a more solid financial footing. Already, $167 million—37 percent of HSPH’s goal—has been pledged or received in quiet-phase contributions. HSPH has received major grants from the Bill and Melinda Gates Foundation, among them $14.1 million to test the “safe childbirth” checklist designed by Atul Gawande, professor in the department of health policy and management (see “The Unlikely Writer”), and $12 million for an initiative on maternal health in developing nations. failing health systems—impediments to effective, affordable healthcare and preventative health services. Junior and senior professorships ($64 million). Supplementing the drive for research support, the school also seeks to endow more professorships. Of its current primary professorships, fewer than 40 percent of senior professorships (and just over a quarter of faculty positions overall) are endowed; many untenured faculty members currently cover large portions of their salaries from research grants or through joint appointments with other, nearby Harvard-affiliated hospitals and institutions. (In comparison, two-thirds of tenured professorships are endowed in the Faculty of Arts and Sciences, which unveils its campaign on Saturday.) The school hopes that endowed professorships will enable more researchers to pursue their own intellectual avenues in a tight federal-funding environment, and the current aim is more to support existing faculty members than to significantly expand professorial ranks. The campaign goal is to endow roughly one junior and two full professorships in each of its nine departments; the actual distribution will, of course, depend on donors, but the target, if reached, would increase the total number of endowed professorships by more than half. Student financial aid ($60 million). Because HSPH’s financial aid relies heavily on endowment income, already trimmed by the recession, the school seeks more funds for student support. Of the approximately $25 million per year the school receives in tuition revenue, $11 million is returned in student aid, not including federal loans, said dean of academic affairs David Hunter in an earlier conversation. He pointed out that aid for international students is particularly difficult to obtain: they are often ineligible for federal training grants. Currently, 65 percent of HSPH students receive some financial aid from Harvard. Infrastructure ($52 million). For many years, the promise of a move to Allston delayed HSPH infrastructure improvements. But now that current plans place the School of Engineering and Applied Sciences in the new campus, rather than HSPH, “We’re moving forward,” says Frenk. “Because [Allston] is a more distant possibility, we are…investing here.” By all accounts, infrastructure improvements are long overdue, with facilities split among 24 buildings, many aging and in need of maintenance. Technological infrastructure is also a priority, as large-scale computation and big data play an increasing role in research from genetics to biostatistics and epidemiology. Transforming public-health education ($48 million). HSPH recently completed a centennial curricular review that argued for a competency-based curriculum, with more simulation- and immersion-based learning; major revisions to its degree programs are also in the works, and the school seeks to remodel existing classrooms to accommodate new technologies and pedagogical approaches. A conference on November 1, titled “The Second Century Symposium,” will address these educational innovations in detail. 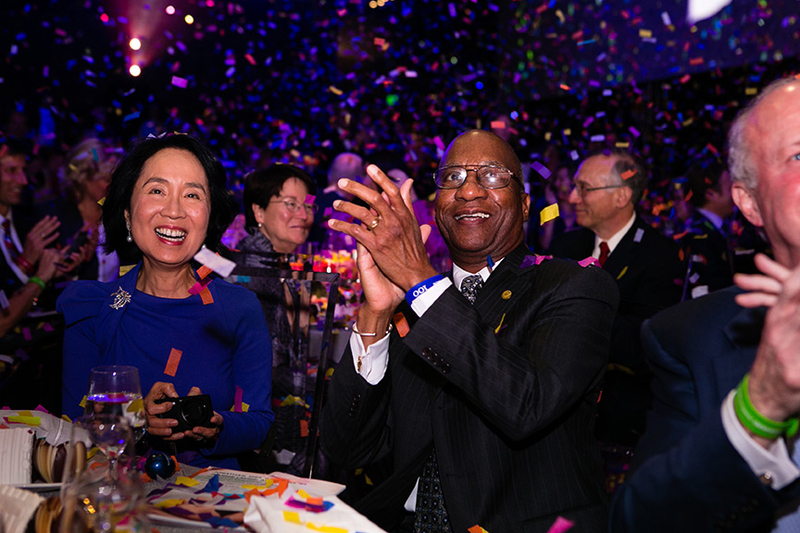 Several recent gifts are focused on education: the school received a $12.5-million gift to sponsor educational innovation from the Charina Endowment Fund and honorary campaign co-chairs Richard L. Menschel, M.B.A. ’59, and his wife, Ronay Menschel, and an anonymous gift of $5 million is already underwriting a new doctorate in public health leadership. Festivities began Thursday afternoon with the presentation of three HSPH Centennial Medals, a one-time award to commemorate the school’s hundredth anniversary, and the inaugural HSPH Next Generation Award, designed to recognize an individual under the age of 40 for their public-health accomplishments. The three Centennial Medals were given to Gro Harlem Brundtland, M.P.H. ’65, LL.D. 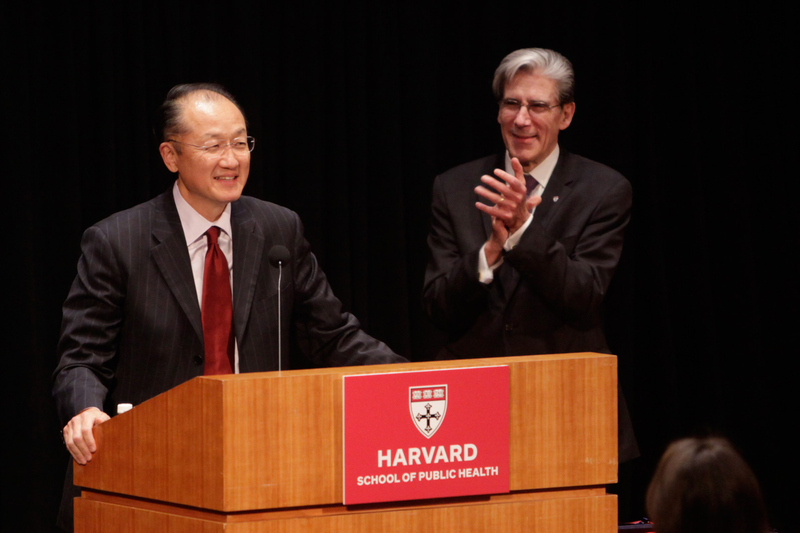 ’92; Jim Yong Kim, M.D. ’91, Ph.D. ’93; and former U.S. president Bill Clinton. Brundtland, the former UN Special Envoy on Climate Change, was cited for “promoting the health and well-being of people and of the planet.” She outlined the collaborations between herself and the other recipients, applauding Kim for expanding HIV/AIDS treatment in developing countries as a senior official at the World Health Organization, of which she was director-general from 1998 to 2003. Chelsea Clinton had worked in Brundtland’s office as an intern, and as for the elder Clinton, the former Norwegian prime minister declared, “You were my favorite American president.” (Their tenures as heads of state overlapped through Clinton’s first term.) “We all link together,” she said, a message echoed by the other medalists. These individuals are the embodiment of what I’ve come to think of as “rigorous humanitarianism.” Rigorous—evidence-based, knowledge-based, research-based. And humanitarianism—compassion at work to improve the human condition—head and heart joined. She spoke about the 30-year increase in life expectancy in the twentieth century, of which 25 years are attributed to public health initiatives. I’m a historian. Historians study change over time. In all of human history, there are few changes as dramatic and as consequential, and as positive as this one. And certainly, it is hard to think of changes of this magnitude that have resulted from explicit human agency and purpose. This instills me with a sense of enormous pride and admiration for the field of public health and for this school’s significant contributions to this achievement. Then one day, as I was sitting there observing, in came a very, very poor woman carrying her grandson in her arms. It was very cold—we were way up in the mountains—and she had walked more than three hours to get this sick child to the town’s small health post. While traveling, she had injured her head, so when she arrived, she was completely covered in blood—in need of care for herself as well as her beloved grandchild. And there was no one. The person who took care of the health post was not there, and the anthropologist couldn’t do anything to help. And, of course, neither could I. Neither could I. For me, this was the turning point. I remember thinking: I am not only going to study these people. I am going to serve these people. You have chosen to care. Beyond that, you have chosen to focus your efforts on science and public health, the most enlightened and lasting ways of making a real difference. Finally, you have chosen Harvard—because it is the best place to invest in research and education to deal with the largest problems of the world. This is the chain of choice that brings you here—now. And this is the chain of choice that will improve health for everyone, everywhere. A video outlining campaign priorities concluded by emphasizing this message of public good: “Tonight, this school turns 100, but more importantly, because of the work we do, untold numbers of people will celebrate another birthday.” A song about HSPH, performed by Bono and The Edge, ended the night’s celebration, accompanied by a shower of confetti.